Asbestos is a mineral fiber found in rocks and soil. It was once widely used in building materials and products to strengthen them and provide heat insulation and fire resistance. It is still used in some products today. When it is intact and undisturbed, asbestos-containing materials generally do not pose a health risk. If asbestos-containing materials are damaged, disturbed, or deteriorate over time, there is a health risk because the microscopic fibers can be inhaled into the lungs. Where could asbestos be found in my home? While most products made today don't contain asbestos, there are many which still might. Testing may be the only way to know if a product contains asbestos. 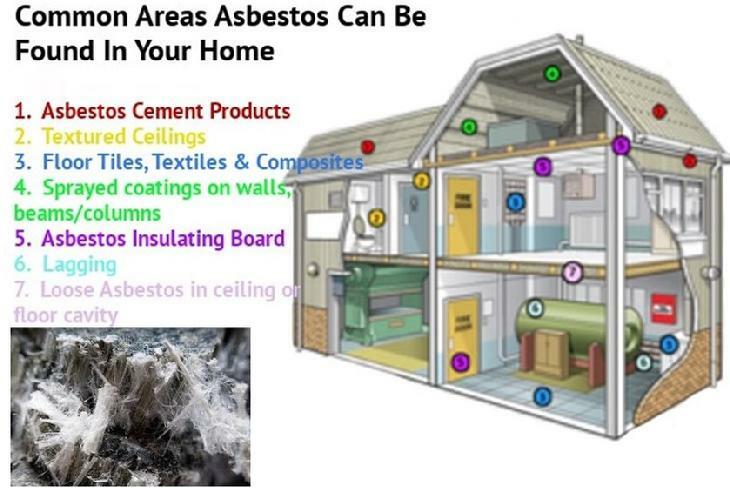 The following are examples of where asbestos hazards may be found in the home. Some roofing materials contain asbestos. Some siding shingles are made of cement asbestos board (CAB). Houses built between 1930 and the 1970s may have asbestos as insulation in the walls or in the attic. Attic and wall insulation produced using vermiculite ore, particularly ore that originated from a Libby, Montana mine and sold under the name "Zonolite Attic Insulation" may contain asbestos fibers. Vermiculite was mined in Libby between 1923 and 1990. This insulation was used in millions of homes and businesses nationwide, and in over 50,000 homes in Washington State. For more information, see EPA's vermiculite insulation. Asbestos may be present in textured paint, popcorn ceilings, sheetrock taping compound, and in patching compounds used on wall and ceiling joints. Their use was banned in 1977. Walls and floors around wood burning stoves may be protected with asbestos paper, millboard, or CAB. Some vinyl floor tiles and adhesives and the backing on vinyl sheet flooring (linoleum) contain asbestos. Learn more about where you can find asbestos on EPA's asbestos website. Building owners must have their buildings inspected for asbestos before construction, renovation and demolition activities. Construction contractors - Disturbing asbestos materials during construction is a serious hazard. Before bidding or starting any construction work, they must obtain a written asbestos report from the building owner or owner's agent. EPA Method 600/R-93/116 The analysis includes testing of bulk building materials for asbestos by performing a visual estimation using the EPA Method 600/R-93/116. This method is the most widely used method for estimating asbestos is bulk building materials and works well for most sample types.